T-34 prototypes up to 1941 from left to right: BT-7M, A-20, T-34 mod. 1940 (L-11), T-34 mod. 1941 (F-34). Note that the armor gets more sloped, the gun bigger, the treads wider. Eastern Front: German panzers as a group generally can be considered to be the best tanks in the world in 1941. Every country has its "best" tanks and is proud of them, but the Panzer III and Panzer IV, along with their accompanying support vehicles, have had little difficult storming across both East and West Europe. While there have been some unpleasant encounters on the Eastern Front with some advanced Soviet models, those have been few and far between. Most Wehrmacht armored troops have never encountered anything more dangerous than an obsolete T-26. However, on 12 November 1941, that begins to change as the Soviets begin to unleash them on both ends of the Battle of Moscow. A German supply convoy near Nargowi Sawod near Moscow in November 1941. 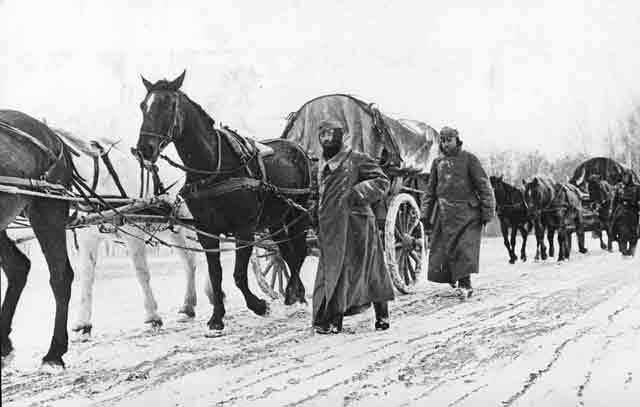 The ground is freezing, making the roads passable again after the Rasputitsa (Cusian, Albert, Federal Archive Picture 101I-140-1226-06). While the T-34 is considered a medium tank, at 26.5 tons it is heavier than any of the German tanks. Its main gun is an L-10 76.2 mm (3 in) gun, enough to easily pierce all but the 80 mm frontal armor of the Panzer IV. The typical Panzer IV, meanwhile, has the short-barreled, howitzer-like 75 mm (2.95 in) Kampfwagenkanone 37 L/24 (7.5 cm KwK 37 L/24) tank gun, which cannot penetrate the T-34's 45 mm frontal armor except at very close range. The Germans, at Hitler's insistence, have plans to upgrade the Panzer IV's main gun to the deadlier 50 mm (1.97 in) Pak 38 L/60 gun, but the first prototype of that is not delivered until 15 November 1941. The Soviets have even heavier KV tanks, but they are slow and the Germans have figured out ways to contain them. The T-34, though, is a good all-around tank that is hard to kill and deals devastating blows. While every country's citizens believe that its T-34 or Panzer IV or Valentine or Sherman is the best, the T-34 is among the elite. In short, the T-34 may not be the best tank in the world, particularly in terms of poor reliability, but in combat, it is at least a match for the best that the Wehrmacht has in late 1941. The Soviets have had them throughout Operation Barbarossa, but only now is furious tank production since June beginning to unleash large numbers of the T-34. 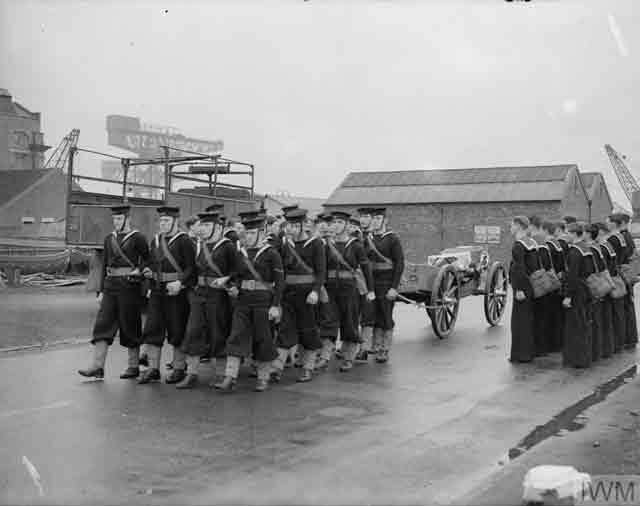 "Seamen drawing the gun carriage with the coffin covered with a white ensign." The funeral is for Able Seaman James S. Tarleton at Rosyth on 12 November 1941. © IWM (A 6226). The impact of the T-34 is felt first at Tikhvin. The city of Tikhvin north of Moscow is nothing special in comparison with the many other cities the Wehrmacht has captured. However, Tikhvin may be the most strategically important place outside of Moscow itself. The city controls the only remaining land routes from Moscow to Lake Ladoga that are in Soviet hands. If the Germans can hold Tikhvin, they can capture Leningrad without firing a shot. Thus, Tikhvin's recapture is absolutely vital to the Soviet Union. The Germans have occupied Tikhvin, but the city is at the tip of a long, tenuous salient east from the Volkhov River which is very vulnerable. The German 12th Panzer Division expended the last of its strength to capture the city, and winter has set it, with temperatures on 12 November 1941 never exceeding 5 degrees Fahrenheit (-15 C). The Wehrmacht is completely unprepared for such weather conditions, and the men are dying of frostbite already and the vehicles have no antifreeze. This is the perfect time for the Red Army to attack, and it does. 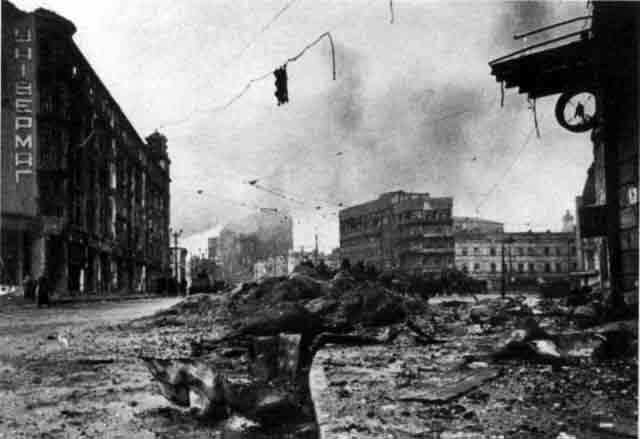 A German photograph in Kharkov taken on 12 November 1941. The city had been captured a couple of weeks previously. Written on the back in German was the inscription, "This is the way street fights have wrecked conquered Kharkiv! As of today, there has not yet been time to clean everywhere." Soviet 52nd Army (General Nicolai Kuzmich Klykov) follows textbook procedure and attacks the German infantry divisions holding the right (southern) arm of the salient. German 126 Infantry Division (General Paul Laux) at Malai Vishera and the Spanish Blue Division (250th Division) just south of there guard that sector of the front. The T-34s form a hard crust around the weaker T-26 tanks. The Germans barely withstand the first shock of the attack and hastily form infantry tank-killer groups which use bundles of grenades to blow off the tanks' tracks. The Soviet attack peters out due to superior German defensive tactics, but it is clear to everybody that more such attacks would be fatal to the German hold on Tikhvin once the Soviets figure out how to use their armor efficiently. "Squadron Leader Henryk Szczęsny, the CO of No. 317 "Wilno" Polish Fighter Squadron, saluting the Polish President-in-Exile, Władysław Raczkiewicz, at RAF Exeter, 12 November 1941. Szczęsny is decorated with the Polish Cross of Valour (Krzyż Walecznych) for the fourth time. 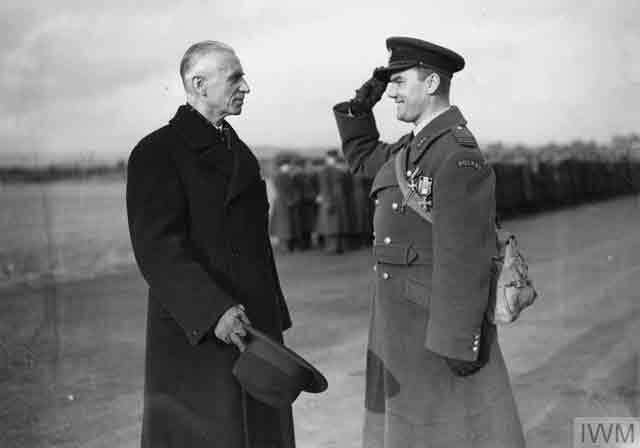 He was also a holder of the Virtuti Militari and the Distinguished Flying Cross." © IWM (HU 111404). South of Moscow, at Tula, General Guderian also is finding the Soviet armor to be a problem. 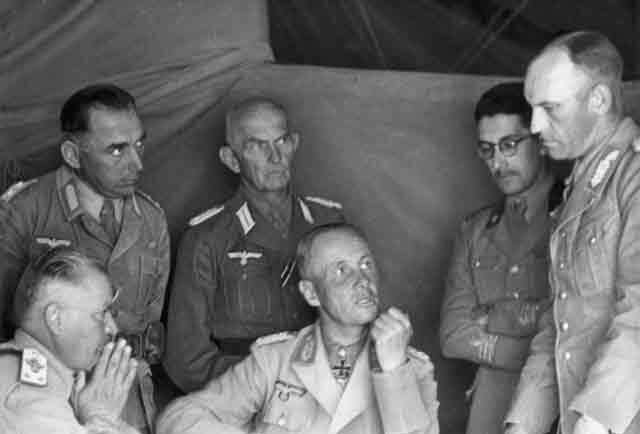 Here, the issue is more his own weakness, as Colonel Heinrich Eberbach's Kampf Gruppe has taken serious losses. The Germans are down to barely 50 panzers. The Soviets are bringing up fresh Siberian troops and T-34 tanks. There is fierce fighting today northwest of Tula where a Soviet cavalry division and two rifle divisions fight to prevent the German 31st and 131st Infantry Divisions from encircling Tula and bypassing it. The fighting there is inconclusive, but with the weather turning frigid and the Soviets continually bringing forward reinforcements that the Wehrmacht cannot match, a tie essentially is a victory for the Red Army. The Germans are still in the fight and have not been pushed back, but they also are not advancing any longer - which means they are left out in the open as winter closes in. 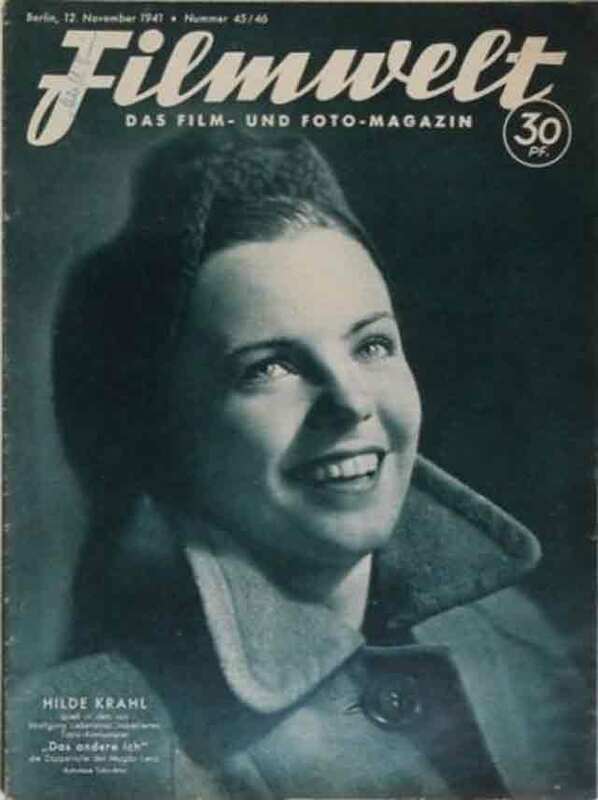 Hilde Krahl on the cover of Filmwelt (Film World), issue dated 12 November 1941.